All in all the bus system is pretty great. I guess you just have to know your Italian slang, and have a good arm to keep the creepers away. On Saturday I was able to go to a reunion with some of my fellow AFS students who are living in the same region as I am. 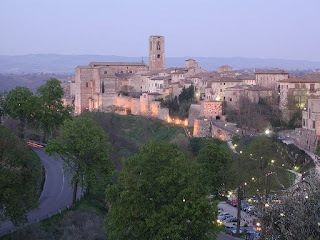 The soiree took place right out side of Colle Val D'Elsa (pictured right, unfortunately not my photography, I forgot my camera.) Although I've enjoyed living in Florence, it was a lovely escape to be in the quieter countryside for the evening. The photo is a very good representation of what it was like to drive by. I hope to visit the city, as it is filled with old, castle-like buildings. I suppose I still haven't grown out of the castle faze... I still daydream of living in a castle with passages, and maybe a wizard. hmmm. We arrived at the beautiful house of one of the AFS Intercultura volunteers, Claudio. I was greeted by a familiar voice yelling "CIAO! CIAO, BELLA!" I immediately recognized the voice as Bridget's, the other American living in the same Tuscan region. All seven of us showed up: Bridget from the States, Magali from Belgium, Lea from Greenland, Ruyam from Turkey, (all of the previous are female) and David from Honduras, and Franciszeck from Poland. It was so nice to spend the evening with such lively company in the fresh country air. The drive back was as lovely as the drive up. I got to see the stars for the first time in a while. I guess that is something I take for granted in Newport, the stars. On the ride home I spent most of the time looking out the window at the big dipper, and it looks the same in Newport, and that was very comforting. By the way, my host mom says "dis bonjour a tout le monde" which basically means "say hi to everyone" (that's French) So hi from Ruth, and hi from me. This is taken from santa croce, it is my school. Monday through Saturday I awake at 6:15 to give myself an hour to prepare for school. I leave the house at 7:15 and take the 11 or 17 bus 2 stops past Piazza San Marco to the famous Duomo of Florence(my picture does no justice to its' magnificence.) In the morning I don't really have time to ogle at the sights, so I just walk right on by. I really can't believe it. From the Duomo I walk to Piazza Della Signoria, which is home to the famous Palazzo Vecchio, which was the home of the Medici family (in their time the most powerful and influential family in Florence. An interesting fact for movie buffs is that a scene from Hannibal was shot on on of the balconies on the Palazzo Vecchio, which I see almost every day. I take a turn there and head straight for Piazza di Santa Croce. In the famed square is the Basilica di Santa Croce, and is also called Tempio dell'Itale Glorie, or Pantheon dell'Itale Glorie. In English that means Pantheon of Italian Glories. It is called this because Italian geniuses such as Michelangelo, Galileo, Machiavelli, Rossini, and Marconi are all buried there. Right across the small Italian street is my school. In the morning many kids sit on the steps of the Basilica waiting for the doors to open. From one of my classrooms I can see into the courtyard. It is completely incredible knowing that across the street from where I'm trying to learn to be more artistic are the remains of Michelangelo, I need say no more about that. The only day that is different is Tuesday, the day I go to San Gallo for school, it is near the Piazza San Marco, and that day I get to wake up 15 minutes later! I get to sleep in on Sundays! like I did this morning. I woke up just as my host parents were leaving for church. I got up and made myself a Sunday breakfast of omelet, toast, and wonderful Italian coffee. It was bliss. My first day in Florence was not at all what I expected. During our lunch my family announced, much to my host siblings' dismay, that we were to attend a wedding that evening. The thought that first came to mind, although I'm not proud to admit, was I look like I just traveled across multiple time zones, WHAT AM I GOING TO WEAR?!?!?! I looked through my suitcase and found some barely suitable, and very wrinkled clothes and shyly asked for an iron. In the end I still looked haggard, but somewhat presentable. We arrived at a small but beautiful catholic chapel, and I hesitantly got out of the car and followed my host family to the door of the church that was surrounded by guests. Upon entering the church my family one by one shook some guys hand... I followed suit, and there was that awkward moment in which I'm sure we were both thinking "who are you?" moments later I was informed that it was the grooms hand I shook. I felt a bit daft. The pews in the church are wooden and uncomfortable... which was good in the long run because they aided me in my desperate attempts to stay awake. It may sound terribly piggish that I was fighting sleep while being witness to the happiest day of some one's life. It may help my case if I add that I would have fought sleep even if it were my favorite movie, or in the Colosseum watching some gladiators fight to the death. With certain amounts of sleep deprivation I find it easy to fall asleep anywhere. Unlike any wedding I have attended we were supposed to stand and sit at different times, I hardly need to say that I just followed the crowd on this one. I was tired, and my eyes sometimes went blurry, but I made it. The ring bearer was the grandson of the bride (they were an older couple) and he was probably 2 years old, and did the job quite well. After the ceremony he was hardly ever out of the adoring arms of the lovely bride, his grandma. After the ceremony, we drove up the hillside (Florence is surrounded by hills) to the reception. I was very surprised to see where it was to take place: an old and grand villa with a perfect view of the city. I was stunned. Florence is truly a sight to behold by day, but there is a certain magic to see it all in lights by night. We went inside and were greeted by the very talented singer, the entertainment for the night. The next room was filled with hors d'oeuvres which were to say it lightly abundant and ritzy. There was pâté, truffle filled pastry, cheeses, and champagne. I was completely sure that this was the meal... there was surely enough to appease every one's appetite with the amount of food. I was so wrong. Soon dinner was announced. Dinner?!? We were seated at tables furnished with white table clothes, and way too many glasses and pieces of silverware. I felt suddenly grateful for the horrendous "Manners Monster" video my younger brother and I were forced to watch as punishment when we were younger, as it reminded me to start on the outside. The dinner took a long time. This is due to the fact that there were many, many courses. On the table was already water, fizzy water, red and white wines. The first course was champagne risotto. (after each course our plates were removed and replaced with clean ones, that's a lot of dishes to do!) The risotto was followed by thin pasta sheets with some kickin' sauce. Next came sauteed veggies, potato and a very nice and perfectly done cut of meat. After that was served came the wedding cake and more champagne. We were moved from the adult section to another room with some Italian teens and two American girls there to study at the university. Finally the last course was small pastry and an open bar. I was completely stunned and barely made my way through the cake. I enjoyed talking with the people my age, and found the Italian teenagers very hospitable and fun to be around. I felt kinda dumb not being able to understand the conversation, but was comforted by the fact that the other Americans were in the same boat. I forgot to mention that the villa was filled with fading and worn tapestries, and very old paintings. This was not some lame attempt at looking vintage, it was legit! I'm still stunned by the old culture and the rich history. The states may be bigger, but it makes me realized how much America seems like an infant compared to the rest of the world. It was a great introduction of Italian culture for me, and I appreciated it fully. There was so much to see, to hear, and to eat! As soon as we arrived at home, I jumped into my pajamas, and was asleep as soon as my head hit the pillow. Tuesday the 2nd I said goodbye to family and friends and headed to Portland to catch my 11:59 PM flight to New York City. After a tearful goodbye to my mom I boarded the plane and began my journey. The sleep was pretty awful, but 5 hours passed by with surprising speed. I found out that about 4 other AFS students from Oregon had flown on the same flight, so we all headed together in sleepy, excited confusion to the baggage claim and on to our meeting point. To my surprise a large group of students with the volunteers were there waiting. I had never imagined that there would be so many high school kids ready to give up everything familiar for a year, it was an incredibly comforting feeling. After arriving at our hotel, the double tree, we were herded into the ballroom and checked in. After the confusion of hotel keys and hauling our baggage up to our rooms we all realized that between time changes ,and the skipped breakfasts, and all the activities we were ravenous. Pizza came shortly after but only left time for a power nap before the orientation began. It is a little blurry now, as there has been so much after the orientation that has happened. I do remember that we were split into country specific groups: Italy, Spain, Portugal, Turkey, Ghana, and South Africa(listed from most to least popular.) We had 'getting to know you' activities, cultural speakers, and a very funny and dated film on gestures. The next morning we only had short group time, mostly covering last minute details. Following group time we crowded around a small TV to watch a funny, but frightening Kiwi film about 4 New Zealanders going on exchange done documentary style. It was funny because of the language and the humor... the scary part was the section in the movie in which every one of them seemed unhappy, lonely and distraught, this was to show us it will get tough. All but one made it through and there was a happy ending. At 2:30 the Italy group left for the airport. There wasn't any trouble and it was pretty easy. Our plane left at 6PM and during our 8 hour flight to Zurich, Switzerland I hardly slept at all. We had about a 4 hour layover there then boarded our flight to Rome. I was asleep before takeoff and didn't wake until our descent. Flying over Italy was a patchwork of green and brown, many hills and little valleys. We all got our luggage(yay!) and slowly passed through customs with no problems, and yes I do have a sporty little Italian stamp in my passport now. We were loaded by country (there were Germans who arrived at the same time) onto buses and taken to a little town about and hour outside of 'Roma'. I tried to pay attention to the scenery but was soon overcome by the desperate need to sleep. Italy is hot right now. Very hot. So we got off the bus that had been blasting the AC and stepped into the hot Roman air. We were used to the next routine: baggage claim, check in, check in baggage, get our hotel room. We were thrilled to be informed by the incredibly brilliant Italian Intercultura volunteers that it was to be a day for rest. So we showered, we hung out, we mingled with students from around the globe, and we ate a much needed meal. I like to note that the camp food is MUCH MUCH better in Italy than New York, duh. The third day I awoke at 6:00 am to load the bus for Tuscan bound students. There is not much to tell. The bus station of course was a bit chaotic, and I got my first view Roma, and was harassed by a crazy man in the station who kept yelling to us "do you love Roma? ", it was quite funny. The train ride was like a count down to the apocalypse. I was so scared to meet my family. What if they don't like me? What if they are mad at me for not knowing much Italian? What if we clash? I had to take many deep breaths. It was kinda like the walls were closing in, and I was getting claustrophobic and crushed by the pressure. As we got off the bus a fellow AFSer from the states found her family right away and promptly yelled "MAMA!" in the typical way Italians are portrayed in American cinema. I was so nervous as I approached a group with balloons and signs. I quickly found my balloon, and snuck around the crowd to find my family. They smiled and gave me hugs and I followed them to their car in the parking garage. The ride home was nice, and I got my first experience in the crazy streets of Italy. I'm now at my Italian home. I will post pictures later, but for now I'm happy comfortable and I enjoy the company of my Italian family.